It may well be true. Then again, maybe not. Before I sprout out from the tree-tops, is this common knowledge and everyone knows but it wasn't posted here, or did someone speak out of turn? The imagined scenario involved the passenger moving about to take photographs of the river and accidentally striking the pilot in the head with his elbow. Could this scenario be a world first? I had heard some time ago that the pilot was caught on video footage slumped over the controls but then I read that there was no video captured. How they worked that out is a mystery if it’s true! That is why you need an AOC to take pictures from an aircraft and a new regulation prohibiting photography from the front seats. Jesus wept Sunfish - we most definitely do not need AOC's and more regulations! Christ - next we will require pilots to wear bone domes and yellow safety vests inside the aeroplane with markings on their skull saying "DO NOT HIT HERE"! Sadly, Josephfeatherweight, I suspect that you are quite correct! For the record; I have never met Sunfish and wouldn't know him even if I tripped over him in a bar somewhere, but even I would have assumed from his post that he was being sarcastic, and even facetious! and your hair has gone rather white.."
Difficult to tell with Sunnies posts. They go from one extreme to the other! Generally in line with the moon phase. Pinky and Jo, yes you are probably right and I owe Sunnie an apology, the difficulty these days is picking the sarcastic comments from the one who genuinely believe we need to wrap everyone in bubble wrap. it was meant in jest, sorry. Sunfish, my sincerest apologies for my exasperated post..
What I find perplexing here is that the aircraft had already passed Jerusalem Bay and was established on normal tracking towards Rose Bay. It seems very odd that an approximately 180 degree turn was made back towards JB from overhead Little Shark Rock Pt. I have often wondered whether momentary disorientation was a possible causal factor leading to a left hand turn into JB after take off rather than following the Hawkesbury to the east. It seems we now have proof that a left turn after take off was not made. Perhaps we will never know why the aircraft made the 180 degree turn back west into a dead end bay? Its now nearly a year since this awful accident...my thoughts go out to those affected by the tragedy. 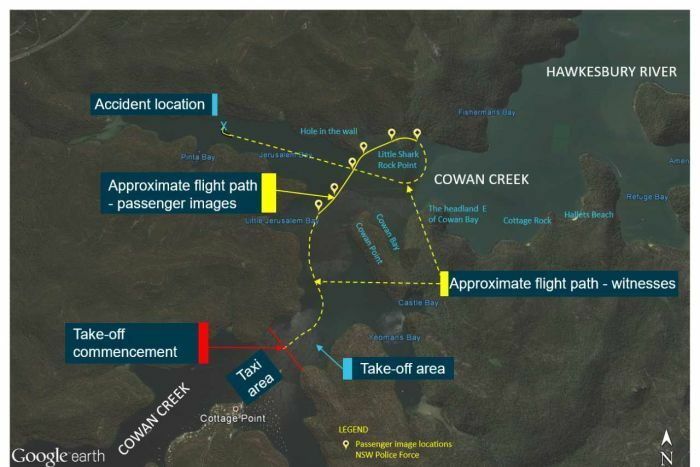 So is there anything in Sydney Seaplane’s new shareholder a few month back blaming the passengers for creating the accident by ‘knocking the pilot out’ whilst taking a photo? Has the proponent of the knock-out theory actually consulted experts in the matter, as one does in matters outside one's own expertise ? The people able to give an opinion about the ease or difficulty of knocking out an adjacent seated person with an elbow would be trained martial artists who use their skills in a practical way, ie., Police and experienced bouncers with high gradings, street experience and martial arts instructional experience as opposed to those with merely club and competition backgrounds. The answers would likely come back .. 'very difficult' to accidentally achieve both sufficient force and to get the right spot. I think the photograper's accidental elbow idea would ultimately be given a low probability. Looking at it from the left seat, I once had a bull session with a mate who was similarly curious about how to KO a right seat pax, as we both regarded that need as being one of those 1:10000 scenarios that could one day come up. We both had martial arts experience and try as we might, we concluded that doing it deliberately was virtually impossible, so we refined Plan B (irrelevant here). An accidental elbow while taking pics is not going to be an explanation. It will be interesting to see what they can infer from all of this. There are many plausible yet unprovable scenarios that this will have to remain an open finding. Having flown Beavers, the dreaded flap selector valve position theory appealed most but it seems that at impact the flaps were at approximately 15 degrees - the so called “climb” setting, thus blowing that theory out of the water. Why the turn back into JB? Maybe a request from the happy and fun passengers to fly in there for a look, cheerful pilot eager to please has a brain snap and isn’t concentrating but chatting and enjoying the day suddenly finds himself in a bad place with no way out? The theory of the pilot being knocked out by an exuberant passenger, while plausible, seems difficult to accept. In all likelihood, he would have been wearing a chunky noise cancelling headset, not leaving much of the head exposed to a blow. I doubt that the pilot could be knocked out by accidental contact with a camera, and highly unlikely there was intentional interference. I’m wondering if there was accidental manipulation of the controls by the front seat passenger. Say, for whatever reason, the pilot has to make the steep right turn. The passenger could have inadvertently put pressure on one of the rudder pedals ( the yoke is throw-over), either but turning his torso to the right to watch or photograph out the window. Rotating the torso to the right usually causes, involuntarily, the right foot to push down. Alternatively, the passenger, unused to steep banking, tries to maintain a vertical posture, with a similar result, pushing on the right leg. The pilot enters a steep bank, 60 or more degrees to the right, the passenger “applies” right rudder. Of course, only speculation of possibilities, but no further stretched than the knockout theory. It also depends if the right side rudder pedals were operational.